@BifBangPow: Bif Bang Pow! 's stuff is in 'Stuff'!! Bif Bang Pow! 's stuff is in 'Stuff'!! Hello everyone, Lenzi back again, with an exciting discovery. Seems the folks over at 'Stuff' magazine, (which, like me, I'm sure you just pick up for the fantastic articles) have gone and done what all intelligent and well read achievers do: they got on the Bif Bang Pow! train. 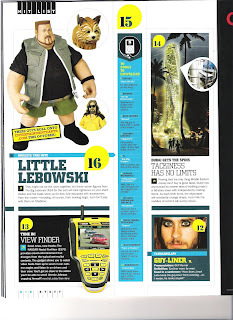 Once again, Walter and the Dude (or El Duderino, if you're not into the whole brevity thing) have placed themselves on a list, the Hit List in the August issue of 'Stuff', to be exact. The editors have even managed to include a nice shot of Cynthia's dog (most likely not, in fact, a Pomeranian as previously stated elsewhere) over Walter's shoulder. So look for it at all good newsstands now, with the lovely Katharine McPhee on the cover. I don't know about you, but I can't wait to get my mitts on that pair. Wait, I meant the figures!! Come on! I have an unrelated question. Whatever happened to the Spaced figures? Is there any hope they will eventually be released? Even The Jesus wants The Dude!